We are a B2B technology solution provider dedicated to creating value through constant innovation, advanced technologies, and outstanding user experiences. We apply our unique blend of knowledge and capabilities to solve a variety of challenges in multiple industries. We are fully integrated to all the major Credit bureaus and many other data sources allowing our customers a full suite of data services ensuring comprehensive Credit Vetting , Tracing and Collections. We have cost effective entry level solutions and enterprise solutions that allow for Customer acquisition, Loans or Customer account management and Collections. For Enterprise and SMME businesses our products offer secure, dependable origination, credit vetting and loans management solutions. Your one-stop cloud-based solution for SMMEs offering bureau reports from the three major bureaus, as well as list non-payers with said bureaus. It also allows you to draw reports from the Deeds office, all in a simple to use online solution. Frontier is a fully integrated credit application processing system that consists out of various components to give the customer a powerful yet flexible solution. Credit application processing has never been this easy. Improve your service levels to your clients, improve your management controls and minimise your credit risk with Frontier. 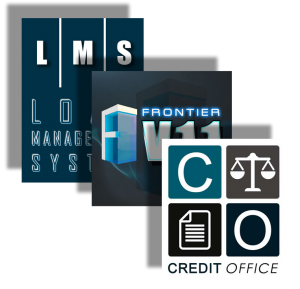 The L M System is a complete multi-user loan management system. It is used to control the day to day transactions as well as offer comprehensive management information. It is specifically designed to meet the unique requirements of organisations with Installment Debtors. The system can be used by banking institutions, micro-lenders, financiers as well as retail institutions using installment sale type transactions eg. furniture companies, computer companies, etc.